No…the hangover does not refer to alcohol…didn’t have even one alcoholic beverage at MMS. It refers to a whole combination of things that adds up to my body simply being spent from last week. Some of it is the really busy schedule. Some of it is my lack of discipline in actually going to bed at a reasonable time. Some of it is the jet lag of going from Florida time to Nevada time and back. Some of it is from getting dehydrated in the desert. Some of it is the significant jump in my caffeine intake last week…coffee and Diet Coke were nearly essential to keeping me alert for some sessions. But now my body is going through caffeine withdrawal. What it all adds up to is that I’m just all over shot today. The tank is empty. I’m done. And I think my body has worn down enough that I’m going to get sick…I think I have a sinus infection coming on. I would appreciate your prayers for my health. I’m going home early today. The Bible Study at MMS was really good. We spent four mornings going through the book of Philemon. We met in Rod and Megan Trent’s suite at the Venetian. It was a really good time to start the day off with a song or two, a bit of prayer, and some time in the Bible before heading into the crazy MMS schedule. Over the course of the four days we had about fifteen different people in the study. There was a core group that was there every morning. Some people flew out early or were unable to come on certain mornings. It was really neat to be able to connect with people on a personal/spiritual level in the midst of a massive IT conference in the midst of “Sin City”. The picture below was taken Thursday morning. As a group we agreed that this was the “First Annual MMS Bible Study”. Very cool. 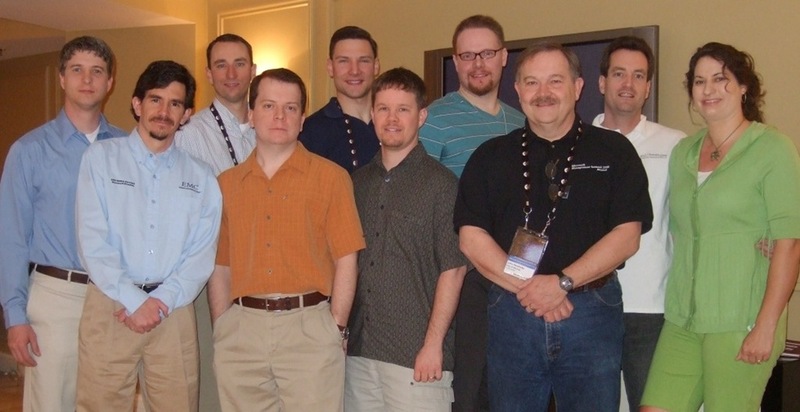 From left to right…the “Redfly Guy” (don’t know his name), Brian Leary, Tim Benjamin, Matt Dewell, Joey Gleason, me, John Nelson, John Hendricks, Rod Trent, and Megan Trent. Someone gave Megan the nickname of “myITforum Den Mother”. It was truly amazing the number of people who came up to me last week as a result of the video at MMS. All week I had people recognizing me from the video. Some just stopped me to say they liked the video. Quite a few wanted to pick my brain about what I had done with OSD in SCCM. Honestly…it was a lot of fun to be able to meet so many people and to hopefully help out a few. One of the funniest comments came from Brian Mason. I had met him last year at MMS when I tracked him down to ask for input on deploying patches with ITMU in SMS 2003. Every time he saw me in the hallways after the video he called me a “rock star”. He had me laughing. I really enjoyed a couple of the conversations I had with Brian between/during sessions…the one that we had while skipping the last keynote was exceptionally helpful. Thanks Brian! I also had a series of funny run-ins on the way home from MMS. As I was in the Southwest Airlines check-in line in Las Vegas, the guy in line behind me was flying to Nashville. He recognized me from the video and made a comment about it. Later, after landing in Orlando, the guy sitting directly in front of me on the plane also mentioned seeing the video. Then…while standing in the baggage claim area waiting on my luggage to come through, I had another guy from the conference come up to me saying something about the video. It was really wild. To everyone who came up to me throughout the week…thanks for the encouragement. I hope I helped a couple of you. Keep checking back to this site. 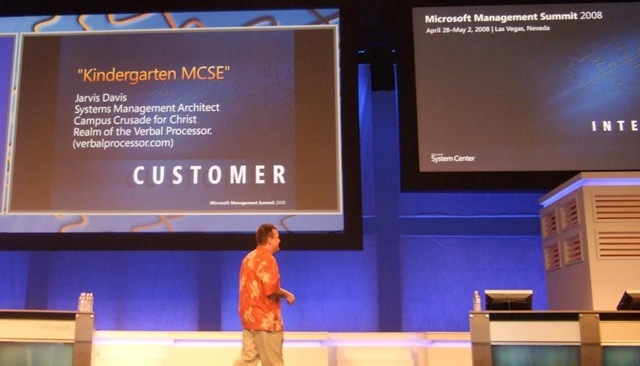 I will continue to post about the SCCM things that I am working through. Hopefully it will help some of you. It was cool seeing the video on the screen at the State of the Nation session at MMS. Here are a couple of pics I took during the session. That is Bill Anderson from Microsoft on the stage. I like the title of the slide he used to intro the video…”Kindergarten MCSE”. The second shot shows a portion of the video where Marybeth is clicking to deploy a computer using SCCM’s OSD. This is the video that I posted about yesterday that was shown during the “State of the Nation” session at MMS this morning. It features me talking about how we are using SCCM OSD, and concludes with my five year old daughter using SCCM to deploy seven computers. Enjoy! A few weeks ago I got an email from Rod Trent about MMS. He said that Microsoft was looking for “face of the customer” videos to show during various sessions at MMS this year. I was already planning to put together a video to use at a technology meeting that we have at the office every month, so I figured I’d send it in. The original video plan was to take the OSD process and condense it to five minutes so that I could present it at that technology meeting. As I got to thinking about the video, the concept for the video changed a bit. I still wanted it to communicate what I’ve done with SCCM and OSD, but I wanted it to be funny also. I talked to a friend at the office who is a director/videographer, and he did a quick video shoot and processed the video for me. A really big thanks to John Boggs for doing that. Thanks bud! Anyway, I sent in the video, and the guys at Microsoft loved it. I got an email from Bill Anderson who is the Lead Program Manager for SCCM. He said their whole team was laughing hysterically at it, and they want to use it during the “State of the Nation” session at MMS. This is the largest session at MMS outside of the keynotes! There will probably be 2000 people at that session. Very cool! Now…with that said…I personally feel like I look like a dork. It was my first time in front of a camera…and it shows. The second half of the video makes up for it though. I’m going to post the video on my blog after the session (tomorrow at 10:15am Pacific). Come back to take a look at it. I have it scheduled to post at 11:00am Pacific. Thanks to all of you who responded that you are interested in the Bible study that I will be leading at MMS. There are currently ten of us that I know about. I’ve heard possibilities of others who are interested, but they haven’t let me know. If you know of others who are interested, and especially if you know of others who are planning to come, please let me know who they are. I need to make sure that we have a place big enough to meet. The Bible study plan is to meet in the morning before breakfast for a max of a half hour. I know the schedule is busy…especially for one of the presenters who is hoping to come to the study. I will hold us to ending on time. We will meet Tuesday-Friday mornings from 7:00-7:30. Where will we meet? Rod and Megan Trent have graciously offered the living room of their suite at the Venetian for us to meet in. I’m not posting their room number on the blog…if you want to come, you need to contact me! The plan is to spend four half-hour sessions on the book of Philemon. It’s a book that I taught through in the LIFE group that I lead at my church. It’s a short little book…only 25 verses, so it is very doable to cover this book very well in that timeframe. I will be taking an “onion” approach to the book. Each day, we will peel back another layer. You will learn something deeper about the book each day. What can you do to prep? Read Philemon a couple of times. It only takes about five minutes to read it. Get a feel for the book. If you are like most people, you’ve never read it. If you wanted to refer to some of the material that I’ve gone through with my class, you could look at this page, but it is not required at all. Looking forward to meeting you folks face to face. It’s going to be a fun time. After my post earlier in the week about the possibility of having a Bible Study time at MMS, I got some great responses, so the Bible Study is on! For those of you who have let me know that you are interested, I will be sending you details later about what/where/when. If you are interested, but haven’t let me know so yet, please do. It will help me make sure that we have a place to meet that is adequate in size. I want to give a big thank you to Rod Trent for mentioning the Bible Study on his blog and featuring it in the myITforum.com Daily Newsletter on April 9. That definitely helped get the word out faster than my little blog! So…if you are interested or would like more information about the Bible Study, send me a message. If you know of others who will be at MMS and might be interested in the Bible Study, please let them know about it and have them contact me. I totally forgot to post this a few weeks ago…I was pretty much laser focused on SCCM implementation at the time…but I found out that I am going to get to go to MMS this year! 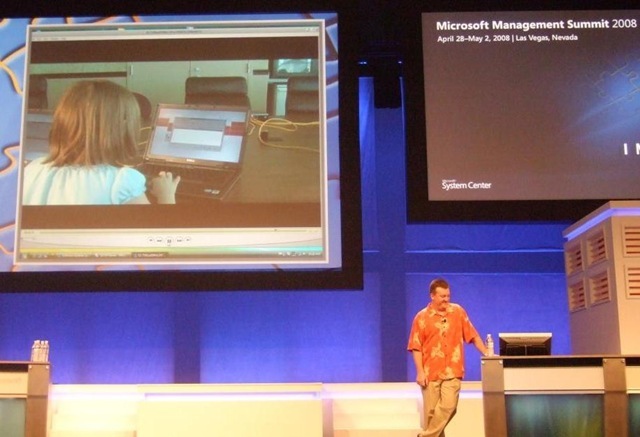 I went to MMS in 2006 and 2007 in San Diego, and it is hands down the best technical conference I have ever been to. I was concerned because our training budget got slashed this year, but I was able to persuade those who control the $$$ that this is critical to the success of some of the direction that we are heading. Basically I know that I am weak in a couple of areas that we are going to be rapidly moving into, and I will be able to get excellent instruction in these areas at MMS. To say that I am excited is an understatement. I’m not all that enthusiastic about where it is being held this year (Vegas), but I will get access to probably the best training available, and will get to spend time with a couple of really good friends as well.